Definition at line 271 of file lscript_tree.h. Definition at line 274 of file lscript_tree.h. Definition at line 279 of file lscript_tree.h. 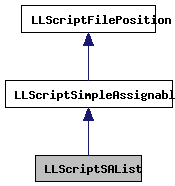 Definition at line 1063 of file lscript_tree.cpp. 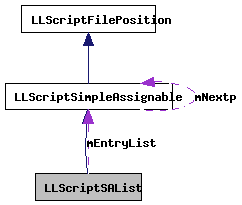 Definition at line 1002 of file lscript_tree.cpp. References LLScriptByteCodeChunk::addBytes(), LLScriptByteCodeChunk::addInteger(), gErrorToText, LLScriptGenerateErrorText::getErrors(), lsa_create_data_block(), LSCP_EMIT_ASSEMBLY, LSCP_EMIT_BYTE_CODE, LSCP_LIST_BUILD_SIMPLE, LSCP_PRETTY_PRINT, LSCP_TYPE, LST_LIST, LLScriptByteCodeChunk::mCurrentOffset, mEntryList, LLScriptLibData::mListp, LLScriptSimpleAssignable::mNextp, LLScriptLibData::mType, NULL, LLScriptSimpleAssignable::recurse(), S32, and size. Definition at line 286 of file lscript_tree.h.